Bring some vibrancy into your life with the iconic colorful patterns of Vera Bradley. 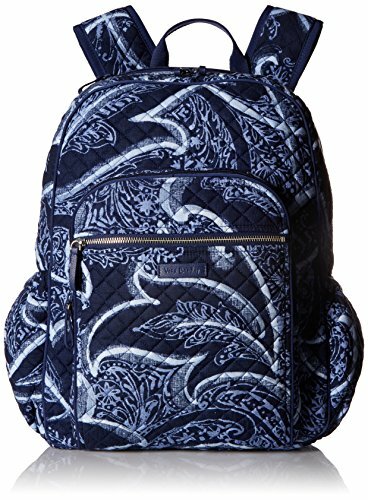 The Campus Backpack is no exception to the Vera Bradley rules of style, bringing you the deluxe designs like only we can. Featuring two front zip pockets and two side pocket, large front zip pocket three slip pockets, four pen pockets with elastic holders and an ID window with. The main compartment features two mesh slip pockets for phones and small notebooks and space for a binder and full size notebook in the primary space. Finally, we have designed a safe and separate zippered compartment perfect for your laptop or tablet with an earbud cord opening to keep your tunes flowing across campus or through the airport. At Vera Bradley, we believe in quality and style which is why we build our beautiful bags to keep you in lasting luxury with our Iconic Collection. It's a perfect fabrication for the customer who wants solid colors in her bags and accessories. The quilted stitching sewn in tight configurations make up the iconic Vera Bradley Signature Diamond Stitch, which not only adds an element of embroidered appeal and aesthetic, but also enhances the durability of your favorite bag. Our bags are made for long lasting convenience and style, this item can be a go-to staple for years to come. At our very core, Vera Bradley is an innovative brand for women. We’ve always been inspired by the needs of real women, and our proudest moments have been when we can bring communities of women together through their shared love of beauty. We design our products with a deep understanding of our consumer. You are the focus of all we do.